Former defensive line coach Chris Wilson. The Eagles stayed in-house and promoted two assistants to be their next defensive line and wide receivers coaches. 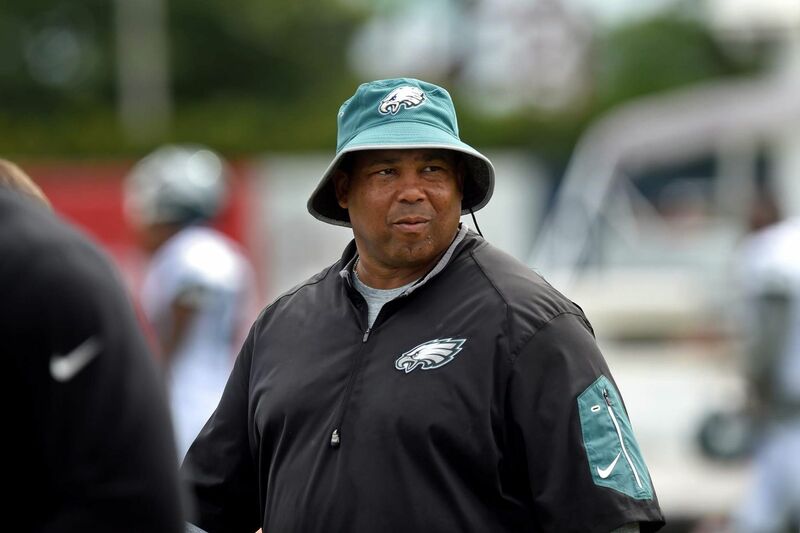 Phillip Daniels, formerly defensive quality control/assistant defensive line coach, will replace Chris Wilson as defensive line coach, and Carson Walch, formerly assistant wide receivers coach, will replace Gunter Brewer as wide receivers coach, an NFL source said. The moves have not yet become official. Daniels, 45, joined the Eagles in 2016. He brings 15 years of NFL playing experience to the job, having played for the Seahawks, Bears, and Redskins. Wilson left last month after three seasons when the Eagles didn’t renew his contract. Walch was hired last offseason, along with Brewer. He had previously coached in the CFL, but spent three seasons with the Bears as an offensive assistant working alongside Eagles offensive coordinator Mike Groh. The Eagles now have had four receivers coaches over the last four years: Greg Lewis (fired), Groh (promoted), Brewer (fired), and Walch.